Earn up to 960 reward points. 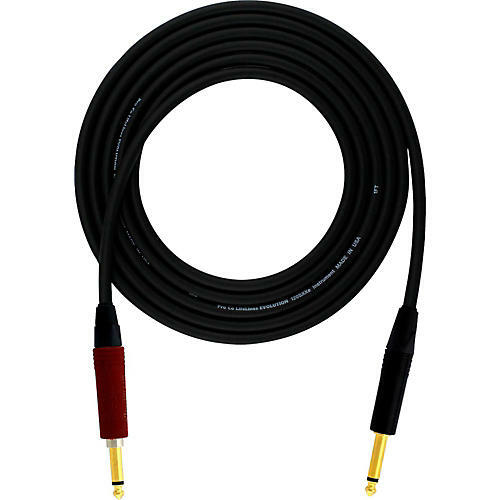 Durable, high-quality instrument cable ensures your sound stays transparent while your cable is never in danger of being kinked or cut. Pro Co Evolution cables are the absolute best interconnects they offer. The exclusive "Soft-Touch" covering is the most flexible and durable available. Compared to other brands, Evolution cables are visibly bigger and durable, yet as limber as an Olympic gymnast. They lay flat without annoying cable "memory" and wrap with ease. Sonically, Evolution cables are made using pristine components with the utmost transparent qualities to protect the integrity of your sound completely from source to destination. Featuring OFC conductors and shielding, low capacitance design, premium Swiss Neutrik connectors with 360-degree, chuck-style strain relief and gold-plated contacts, and their exclusive "Soft-Touch" jacketing, these cables are designed to not only feel good, but also be the best-sounding cables in your arsenal. All Pro Co Evolution cables are designed and hand-soldered in the United States of America. For use with instrument (guitar) applications only. Damage may occur if connected to amplifier output. Please note that the signal isn't muted with some types of active electric guitars which are equipped with tip-ring-sleeve jacks that tap to activate the guitar power supply. Order this great cable today!